Hello everyone and welcome to my new blog, Rock My Classroom! I know it looks a bit bare, but I’m not the most technically apt, so please bear with me while I find my way! I decided to set up a blog because I am constantly inspired by images I see shared online by other early years bloggers and thought I might give it a whirl myself. Days 3, 4 & 5 – Pom Pom sorting with differentiated tools – tweezers, tongs and starter chopsticks. I daren’t remove this after 2 days. The children loved it and turned it into an ice cream parlour! Gloop and powder paint exploration. 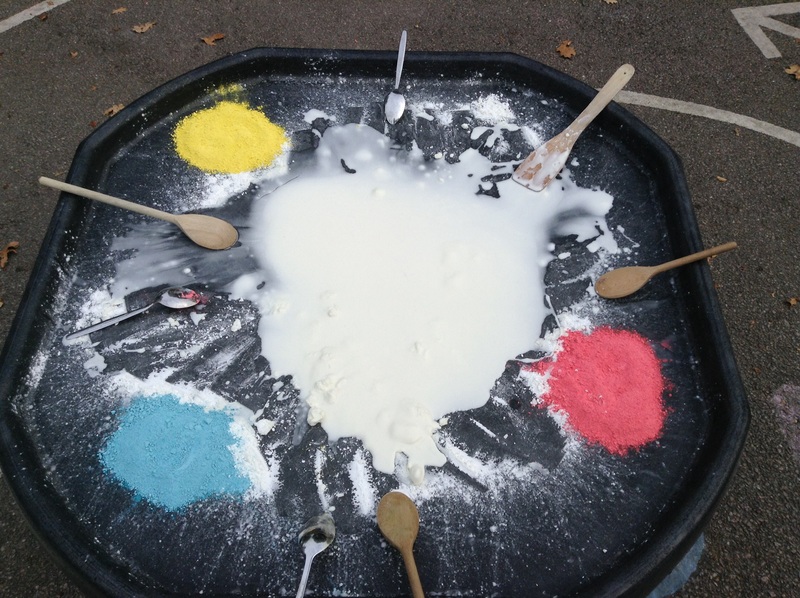 Of course they were more into the colour mixing and investigating the texture than writing their names in it! Alison, you’re amazing! Good luck & I look forward to seeing what’s next! p.s. 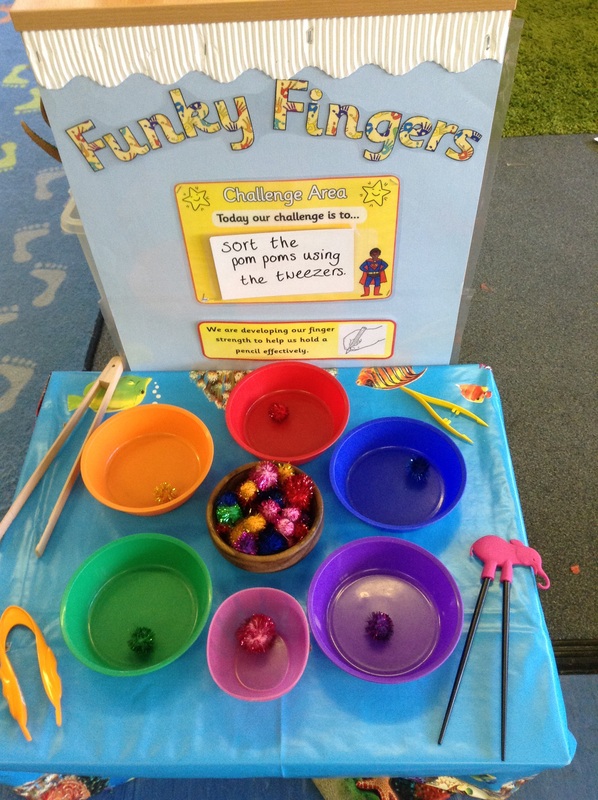 I soooo want to try funky fingers! Well done. It’s never easy beginning a blog. Lovely photos btw. Love your funky fingers ideas. Will need to try that out. I love your photos & am so glad you decided to start a blog, the more of us, actually working in the sector that can share good practice the better. Best of luck with your blogging journey. 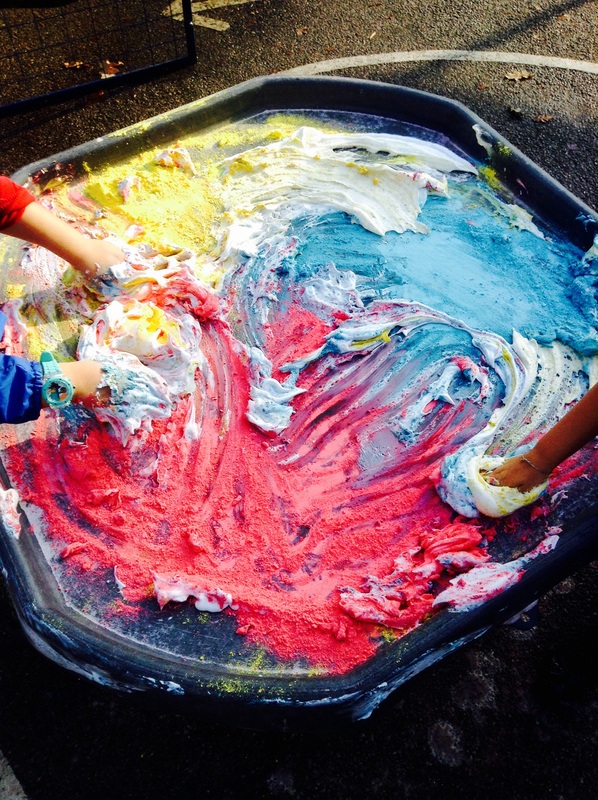 I love the messy colour mixing! Congratulations! I’m just about to do the same and I’m sooooo nervous! 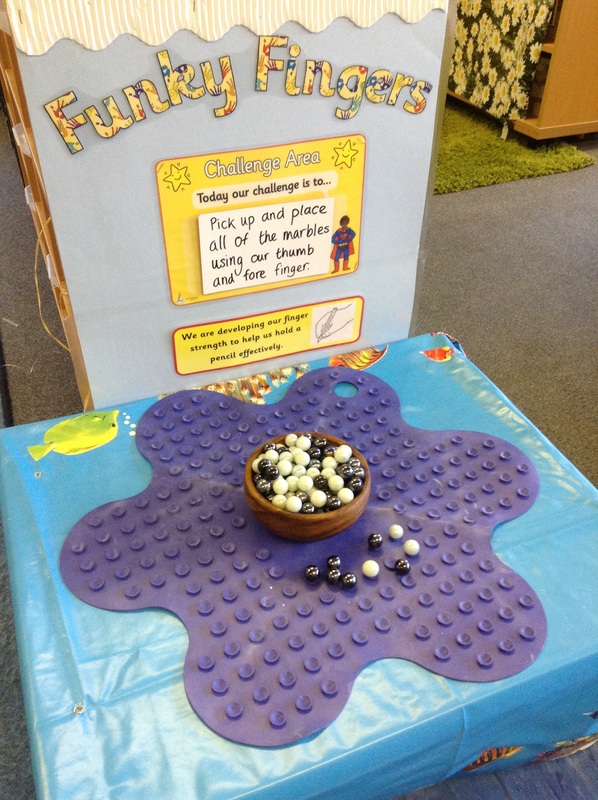 The activity ideas are wonderful. I imagine that the resources for all of these wonderful ideas is quite costly. If I did this, my setting would not be able to keep up financially and would not be pleased that I was buying so much! In order to provide the children with all of these resources, I’d have to buy the items out of my own wages. How do you manage the cost? Every half term we send home a small envelope and a note asking all parents to send in a £3 class fund contribution. We buy a lot of resources with this fund. We were also very lucky to get quite a healthy budget from our head teacher every year as she understands the importance of quality resources and how these need to be frequently replenished. I’ll admit that I spend quite a bit of my own money too, but when I move schools I take whatever is mine, so have gathered up a great wee stash over the years! Oh and I tend to buy things on offer/from poundland or other bargain shops!